Prosper Australia sees free access to quality land price data as a major way to reduce information asymmetry between buyers and sellers. In other words, it is harder to fool people who know the market price and where it is trending. 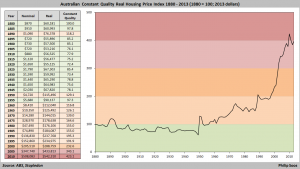 There are many private providers of real estate sale price statistics, like RP Data, SQM Research and the REIA. They cluster around the froth of weekly auctions and monthly price changes and are continually quoted in the mainstream media. The Australian Bureau of Statistics data is accurate and well thought out. Sadly it is typically six months old at time of release, which limits its value. Prosper has repeatedly railed against this delay, see here and here. These sources are little help to home buyers, who need to make an informed decision about whether buying now will prove sensible in a year, in five years and in ten years time. The price of land – the largest asset class in every country – moves in very long cycles, typically 18 years, with larger super-cycles that can run for generations. 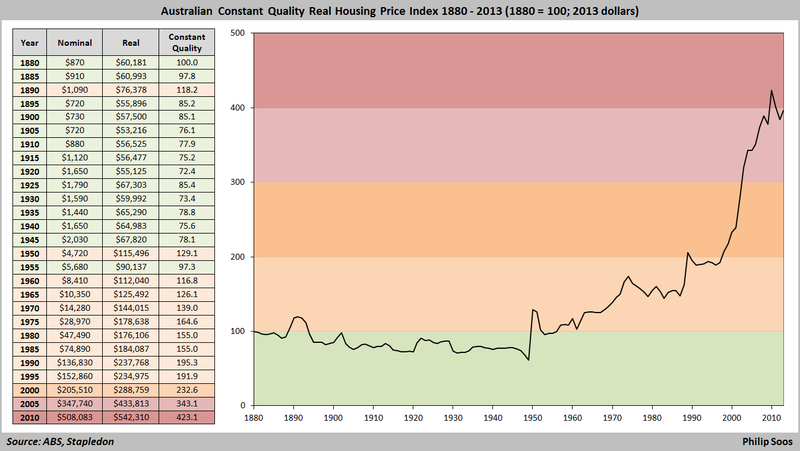 Want a single graph that describes where house prices are? Presented here is Australia’s single most comprehensive land value dataset, some of which dates from colonial records as early as 1836. This was compiled by Philip Soos, drawn from both new and esoteric public and private sources, including that of economists Robert Scott, Doug Herps, Alan Taylor, Terry Dwyer and Nigel Stapledon. World leading data on land and housing vacancies. Check our evidence for more data driven reports. I believe that your report is correct. We are looking for a house to buy in the Skye/Carrum Downs area and/or the new Cranbourne West area. Over the past two weeks, through different agents, we have inspected seven vacant houses. Two were builders spec houses, two were owned by a builder who used them for display homes and the rest just left vacant after the tenants./owners moved out. They have been vacant for some time, but one house has been vacant for two years. The prices were inflated for what you got. I have written to Mr Christopher about this to show him that just a small area near us has many vacant houses. The house across the road from me has been up for lease or for sale for the past four months. This is a one year old house. Many houses in this estate can not get a buyer, even under the replacement cost. When you look at the sales in Melbourne inner most of them are being purchased by overseas buyers.